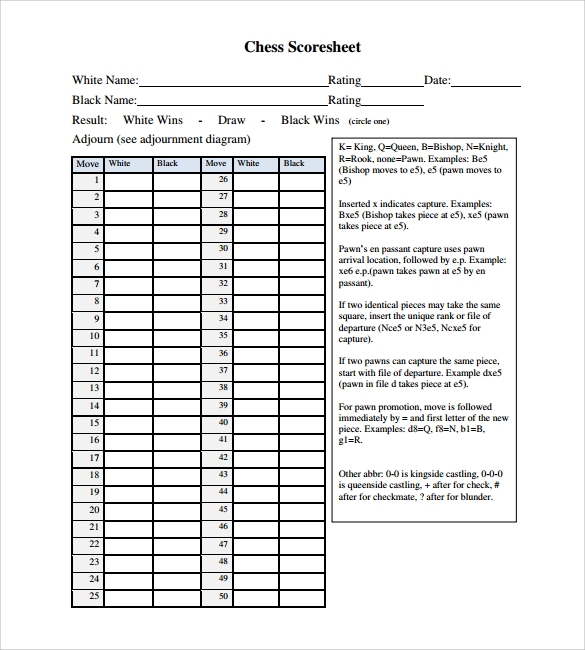 Chess score sheet is the printed document to mark the points of the two player’s moves and piece taken in the game, as the game of chess requires critical and analytical thinking for every piece to be moved in order to have a checkmate; the recording tool where the referee or judge can categorize the points that each player must have for every moves and piece taken from their opponent.The sample format you need is seen online are free where you can download it and have it modified based on the chess game played, Microsoft word and excel also can be used for this score sheet if you want to make it personalized. 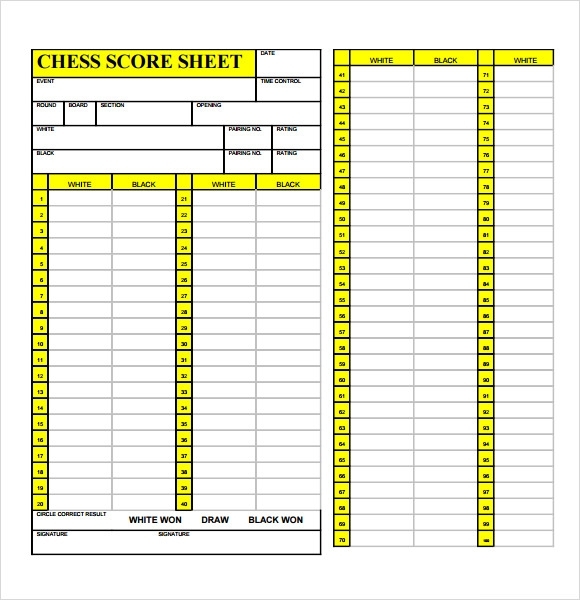 This chess Bridge Score Sheet Templates will make sure that each point is recorded as each player reach checkmate for them to win the game. 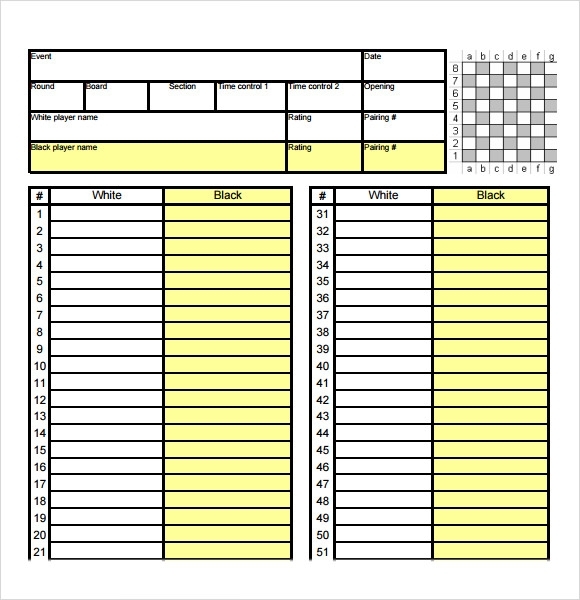 This sample chess score sheet keeps a detailed record of up to a 100 rounds to be played. It provides slots for recording information such as date, name of the event, time control, round, board, section, opening, pairing number, rating etc. It also has a slot wherein the number of wins can be summed up and the winner can be declared. 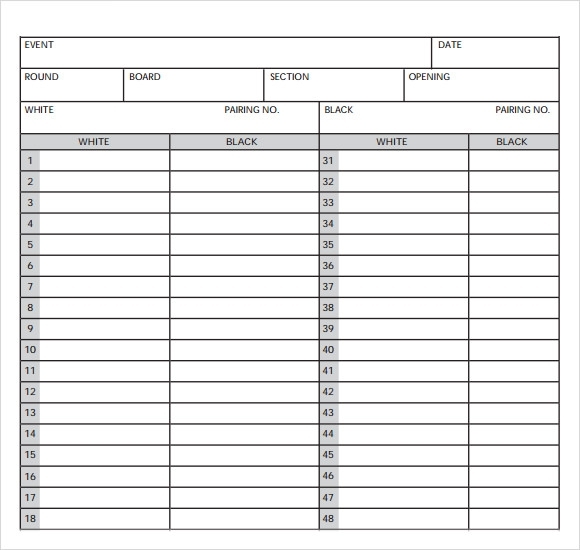 This is a simple and sleek design template for a chess score sheet allowing for the names of the players playing for white and black respectively to be noted along with the date, place and the duration for which the game lasted to be noted as well. 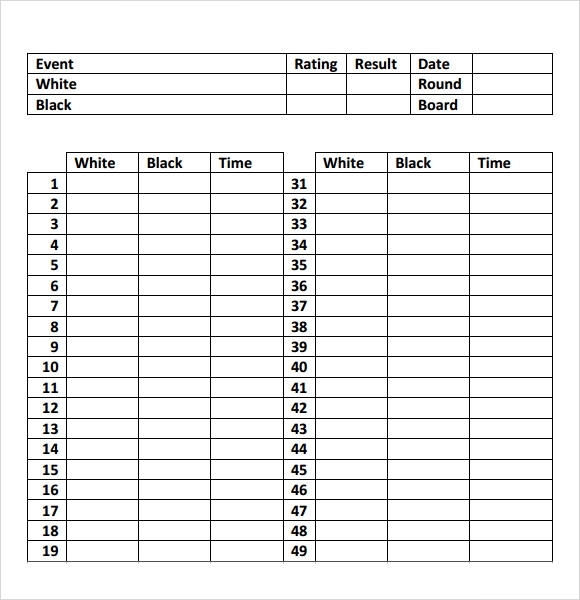 This is very similar to the previous template just with a little bit of extra detail, it allows for the name of the event to be recorded along with rating of the players playing for white and black respectively and time slots given for each game. This is a pre-designed ready to use template that can be downloaded and put to use. It is very much like the previous template except that it has a few additional features which are separate pairing number slots for both the black and white team. When is Chess Score Sheet Needed? Chess is a strategic board game for 2 players which is played in a black and white chequered board with each player owning a team of 16 pieces of black for one and white for the other. The pieces are allowed to move across the board according to certain precise rules. The main motive is to slay the king, that is, to put the opponents king piece under a direct attack which is inescapable. Chess can be very interesting as well as very boring; it depends from person to person. The varieties of strategies deployed in the game make it interesting, however, the lack of pace in the game make it very boring.You can also see Sample Hockey Score Sheets. What is a Chess Score Sheet? 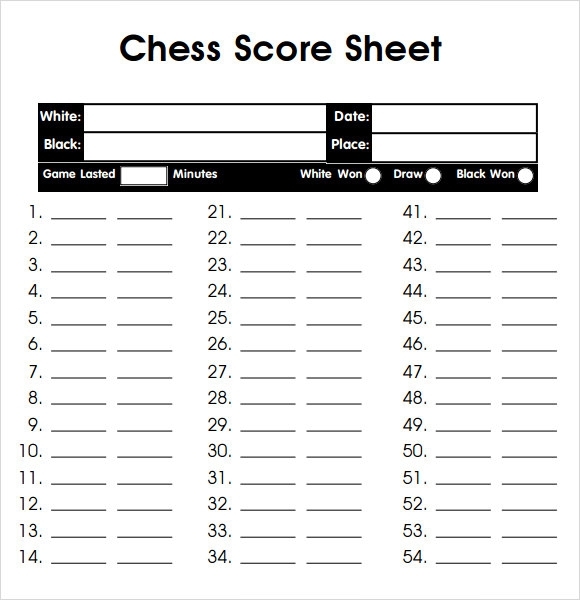 A chess score sheet is basically a piece of paper or a document which records all the related information for a chess game or a series of chess games. This information includes the names of the players, the sides they are playing for, the event they are playing for, the date, place, number of rounds, records of who won which round, player ratings, etc. There is also a slot for tallying and summing up the scores so as to ultimately decide who has won the bout. 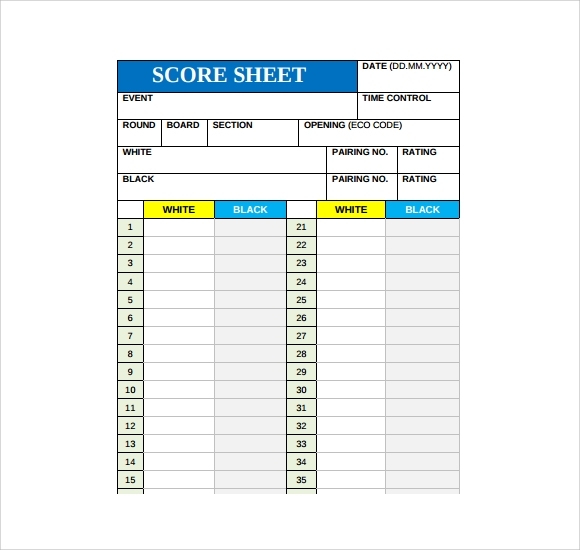 A score sheet is not really an important part of the game unless it is being played at some professional tournament. 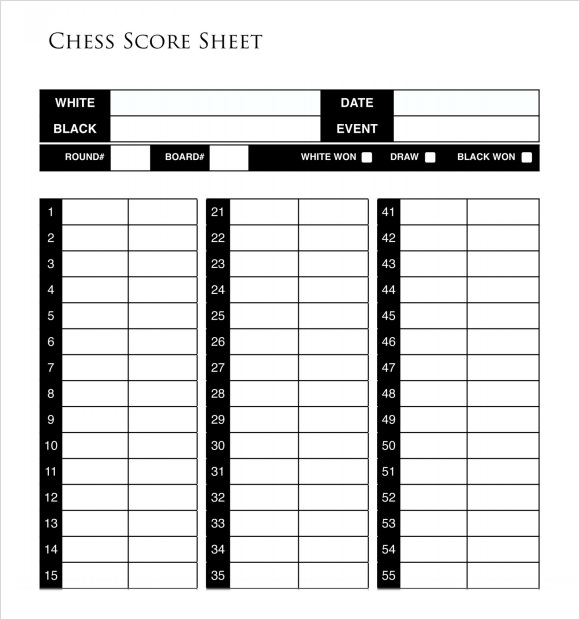 How to Prepare a Chess Score Sheet? Preparing a Chess Score Sheet is extremely easy. All you got to do is decide what are the types of details you want to show in your Chess Score Sheet and put that into columns arrange them in a presentable manner and you’re ready to design. One suggestion would be not to overcrowd your score sheet with too much information as it looks much clustered. 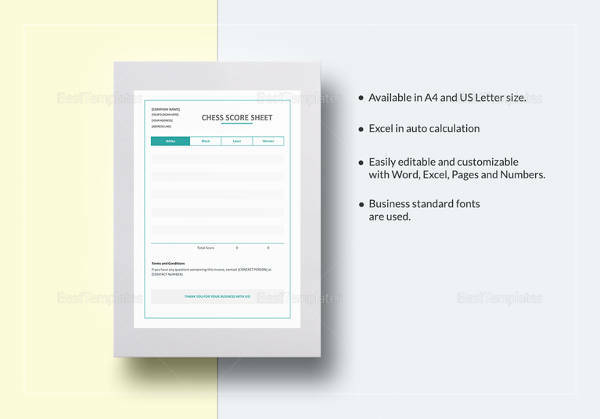 Instead of going through all of the hassle of preparing a score sheet all by yourself, just download one of the above and get your work cut out for you. These are some of the finest, ready to use, printable templates that might just be able to satisfy your need.You can also see Sample Cricket Score Sheets.